Despite the growing popularity of plant-based foods, global meat consumption has been sharply increasing for more than half a century. * Left unchecked, it will continue its dramatic rise with dire consequences. The United Nations warned in its 2006 report, Livestock’s Long Shadow, that meat consumption will double over 50 years, moving from 229 million tons in 1999/2001 to 465 million tons in 2050. As of 2019, the predicted trend is on course with about 75 billion animals per year reared for meat, dairy, and eggs. In terms of number of animals, this increases the 50 billion animals reared and slaughtered annually (5 million/hour) in the year 2000 to 120 billion animals in 2050 (an increase of 240%). The number of land animals more than doubles because the consumption of poultry is growing at a higher rate than the consumption of mammals. Since birds are smaller and weigh less than mammals consumed for food, it takes more animals to produce the same amount of meat. By weight, consumption is predicted to double (200%). The “Livestock Revolution” specifically refers to the increases in meat and dairy consumption stemming from the low- and middle-income countries. 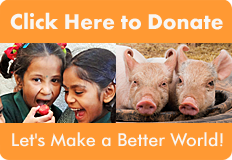 When lower income populations gain financially, they consume more animal-sourced foods. These emerging economies can represent nearly half the world’s population. Add to that relatively high birth rates, and the aggregate consumption increases result in a steep and dangerous upward trend. drastic increases in the consumption of meat, dairy, and other animal products. Unfortunately, many supply-side solutions focus exclusively on increasing yield and mitigating environmental harm through technological fixes. Demand-side solutions too often focus on population management to the neglect of consumption management. Solutions promoting plant-based hunger solutions and/or reduced consumption of animal-sourced foods are too often ignored or dismissed. As referenced above, the “Livestock Revolution” and other works that focus on the dangers of “increasing” meat and dairy consumption are important in understanding global trends. In terms of creating global change, however, it is imperative to also consider the impact of “current” high levels of animal-sourced food consumption among high-income and/or high-consuming populations. To focus on increases in consumption to the neglect of current high rates of consumption is problematic on many levels. When measured by percentage, low level consumers appear to have higher levels of growth, which can be misleading if the numbers aren’t understood in context. For example, if China has an initial consumption level of 2 and they double it, their consumption level is 4 (a 100% increase). On the other hand, if the United States has an initial consumption level of 10 and it increases by 2, it’s a 20% increase. Looking only at the percentage of growth is misleading and bias against lower level consumers (100% growth for China vs. 20% growth for the U.S.). China is seemingly a larger consumer based on percentage of growth, even though the U.S. is actually a much heavier consumer — especially per capita. In fact, the United States is one of the largest per capita meat consumers in the world. In real terms, while China’s total consumption of meat is comparable to the United States, their population is about four times larger. With China’s per capita meat consumption about half of the United States’s consumption, it is difficult for the U.S. to have moral authority in seeking reductions from China (or others). For the high-income, high-consuming countries to have legitimacy when seeking global reforms for food security or the environment, policies and recommendations for other countries must also be combined with domestic reform efforts. It’s too convenient for powerful and wealthy global actors to push “others” to change (diet, population, etc), without also improving/decreasing their own (over)consumption. Decreasing consumption among food-secure, high consuming populations has tangible global benefits in that there is greater room for decreases, so the impact is more immediate. It also sets a good example of the behaviors of wealthy, powerful countries. To the extent that increases in animal consumption stem from their association with wealth and well-being, these associations can be reversed. Instead of celebrating animal consumption as economies improve, nutritious plant-based diets could be embraced for their public health and environmental benefits. A Well-Fed World urges elevating the promotion of plant-based foods as key components of global hunger reduction and global food security efforts. Instead of assuming that increased consumption of animal-sourced foods is a given or inherently beneficial to undernourished populations, plant-based solutions should be given unbiased consideration. In populations where there are already high levels of animal-sourced food consumption, reduction measures should be swiftly and broadly implemented.